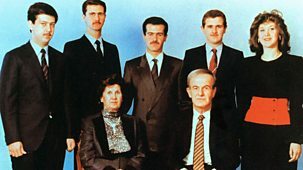 Three-part series delving into the story of the Assad dynasty. Right at the centre of it are President Bashar and his wife Asma, who met and fell in love in London. Bashar al-Assad trained to be an eye doctor at St Mary's Hospital in Paddington and Asma was a British-born girl from a Syrian family with a career in investment banking. Over a decade ago, they were being welcomed with open arms in Britain. Today, they are entrenched in a brutal war that has led to some of the most horrifying crimes of modern times. Told through rarely seen footage and testimony of those who knew them, worked with them and studied them, the series explores how the couple, who at first were seen as a modernising force, ended up running a regime accused of war crimes.\n\nThe final episode gives the view from the presidential palace as the country descends into civil war, charting the moral lines crossed over the past seven years. Bashar al-Assad has been president of Syria for a decade, while his wife Asma is enjoying her role as first lady, pushing charity drives and encouraging schoolchildren to discuss democracy. As a glamorous profile of Asma appears in Vogue magazine, the Arab Spring protests reach Syria. Bashar must decide whether to concede to their demands for greater freedom or follow in his father Hafez's hard line steps. What unfolds shocks the world in its brutality. As the chaos of civil war rages, the so-called Islamic State emerges and it looks like Bashar is on the brink of losing the Assad dynasty's control of Syria. Then a saviour emerges, turning the war back in his favour.